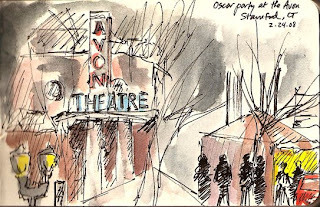 Had dinner at Capriccio Cafe on 2/24, and could see the local officials and well-heeled guests arriving for the Oscar party at the Avon Theatre across the street. Sketched the scene between pasta and dessert; had to split the scene in two because it wouldn't all fit on the page to scale. (The tent was really below/in front of the theatre part.) Lots of lovely gowns and dapper tuxes.